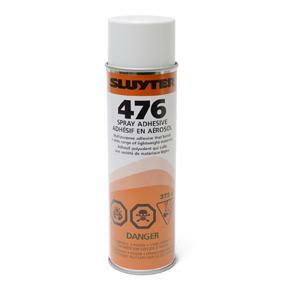 This fast tack and fast drying characteristics of the 476 Spray Adhesive result in a strong and permanent bond. Used for bonding urethane and latex foams to themselves, fabrics, wood and metal surfaces. Formulated to reduce "soak-in" and staining on fine delicate materials and fabrics. Spray Characteristics: The 3-way valve allows for the adjustment of the spray pattern from a narrow to a wide band for optimum spray control. Application: Apply to both surfaces to be bonded. For porous surfaces a second application is recommended prior to bonding. Bonding Range: Apply to both surfaces. Wait until adhesive is tacky ( 1 to 3 minutes) then join surfaces and apply pressure during drying. Cautions: Flammable Aerosol. Harmful or fatal if swallowed. Follow all safety recommendations printed on the can. Coverage: Covers 220 Sq. ft./lbs. of adhesive used. Area varies based on thickness of layer applied. Uses: Adheres to many types of flexible polyurethane foam latex foam fabric, polyester fiberfill, wood, plywood, particleboard, and many plastics and metal surfaces.